Although Olympia is a most inconvenient site to visit, the remote location is part of its charm. I don’t encourage you to go from the other side of Greece just to see it unless you are an archaeology fiend such as myself and my parental units. If you do make the trip to Greece and you are interested in ancient ruins then, however far you travel, it will be worth your while. Olympia in its ionic beauty: so many columns! 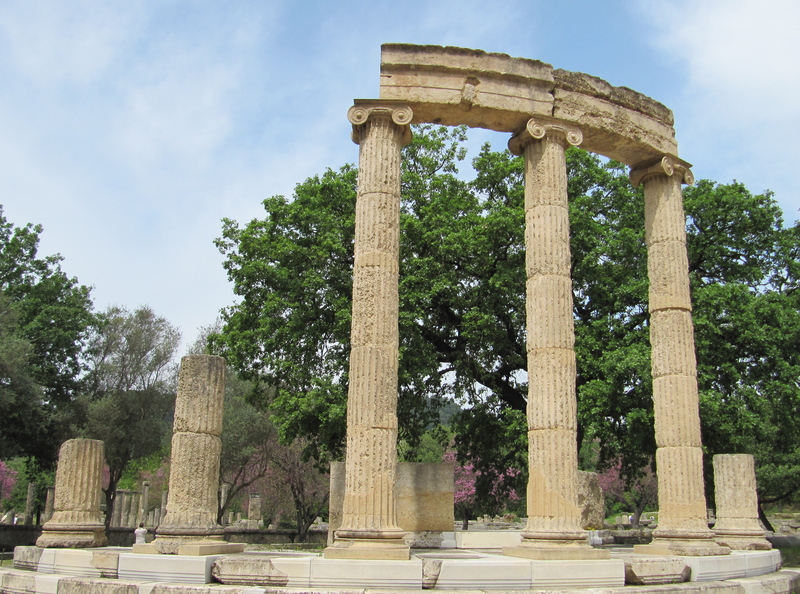 The ancient ruins of Olympia are set in a magical, green park area. While they are extremely beautiful, the modern town has little to offer the tourist. You can get a hire car there or a bus to the site from the modern town. I only had about 5 hours there but I wish I had longer – the museum is fantastic, we could have spent all day in there. I recommend anything but driving there yourself. Unless you can read Greek, drive on the right (“wrong”) side of the road and aren’t terrified of little gypsy kids sticking their grubby little paws in the window at red lights then get the train or bus. The parental units and I drove in a hired car and almost got divorced – all three of us. The journey of 20 minutes was an hour each way as we couldn’t read the Greek signs for the turn-off – the way back was especially difficult as the signs on the highway for the turn-off were all in Greek. Also, the wheel was on the wrong side of the car which makes it hard to drive. And the parentals like to scream at whoever is in the driver’s seat. They really hurt my brain and I almost walked but it was hot and my hair would’ve gone all flat. 1) Go straight to the Olympia Museum. Everything found at the site is in here including Praxiteles’ Hermes with the infant Dionysus. I have never actually gasped at the sight of a sculpture before, it is the most beautiful marble work I have ever seen. On the statues of ladies, the drapery of their clothing is so well done by Olympia’s master sculptors that they look like real fabric instead of marble. The museum also houses the Helmet of Militades which he wore at the battle of Marathon against the Persians in 490BC. 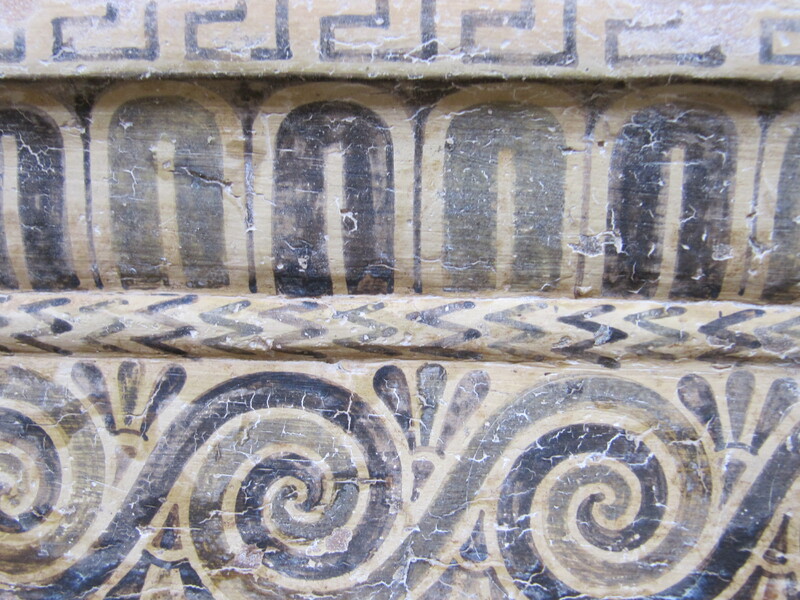 It’s also wonderful to see how things used to look in Ancient Greece – some of the facades fragaments of the buildings with their intricate paintwork is also on display. 2) If you are travelling, as I was, with 2 geriatric coffee addicts the cafe in the museum is nice. If you are not a geriatric coffee addict yourself, as I certainly am not, grab a pastry. There are good bathroom at snack facilities throughout the site and it’s a nice place to have a walk in the fresh air, so wear some trainers. The Temple of Hera, where the statue of Hermes by Praxiteles was discovered, is built in perfect preportion and housed donated treasure such as fine furniture, inlaid cedar boxes and artwork. For me, Phidias’ workshop is was the most interesting site and one I had dreamed of seeing since I’d studied about it at school. It was only discovered in the 1950’s: tools and a cup bearing the sculptor’s name was the evidence we needed to prove that this was indeed his workshop. The building is in remarkably good condition. Phidias is the little man who made the 12 metres high stature of Zeus and we only know of its’ existance from written accounts, from coins and contemporary artwork. Perhaps one day we will discover what became of Phidias’ marble and gold creation. 4) It’s nice to see the Stadium, the Treasuries and the Palaestra as well but I think the places listed above are the main attractions. Unfortunately, some of these were under excavation at the time that I visited Olympia so I don’t really know much about them. In conclusion: have a good time, stay there for at least 6 hours, bring a hat, bring your parents only if they can behave and don’t drive there unless you can read Greek.